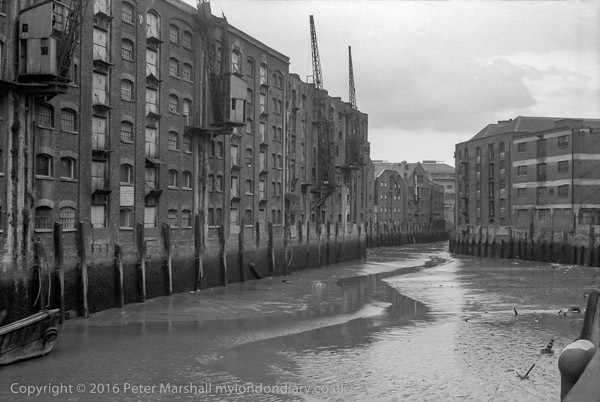 I first photographed Shad Thames in 1980, though I’d looked down from Tower Bridge a few years earlier. 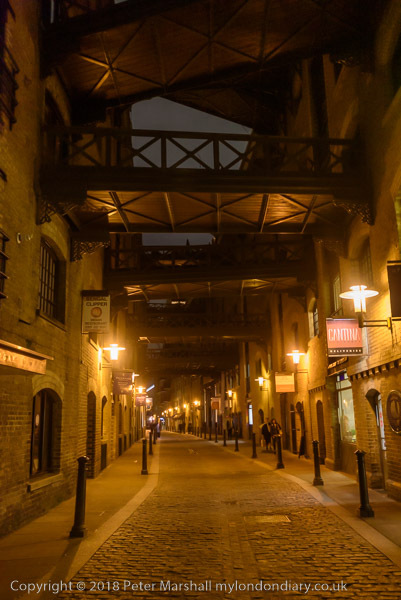 It was a time when I was discovering so many new areas of London to photograph, and also when a very stressful teaching job was taking up far too much of my time – and having two young sons also took up a fair amount of my time. But in April 1980 I moved from an 2000+ comprehensive to a sixth-form and community college, considerably cutting my stress and also reducing my journey times by over an hour a day. It meant a small drop in salary as I was no longer in charge of a department, but gave me more time to spend with my family and on photography. The area was then largely empty. 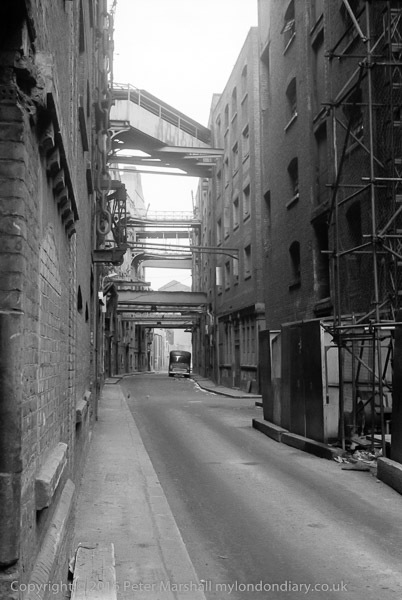 The last working warehouse had closed in 1972, and some of the buildings had become artists studios, with many also moving in an sleeping there strictly against the law. Some were evicted in 1978, and others after a disastrous fire the following year, leaving the area deserted. The redevelopment only really got into gear in 1984. It looks better now at night than during the day, when the loss of atmosphere is much more marked. I hadn’t gone to photograph the area, but had arrived early for a protest at Southwark Council offices in Tooley St, so took a walk a little further on. I’d wanted to take a look at St Saviour’s Dock just to the east, but the riverside path was fenced off for the footbridge added there in 1995 to be refurbished so that it can be opened again to allow large boats up the dock. The footbridge which took the Thames Path across the mouth of the dock was one of the few wholly positive aspects of the redevelopment of the area, saving a diversion to Dockhead and back to the river and should be reopened in the Spring. Here’s what the dock looked like back in 1980. The colour pictures in 2019 were made with a Nikon D750 with the Nikon 18-35mm f/3.5-4.5G ED zoom wide open with shutter speeds from 1/15 to 1/40th s at ISO 6400. All were handheld. Back when I was taking the black and white images I used various films, the fastest of which was Tri-X, nominally rated at ISO 400, and the slowest was Kodak Technical Pan, sometimes rated as low as IS0 5. Then I often carried a tripod, but it’s now years since I did, as most things I photograph have people moving in the frame. More pictures from 1980 on London Photographs. 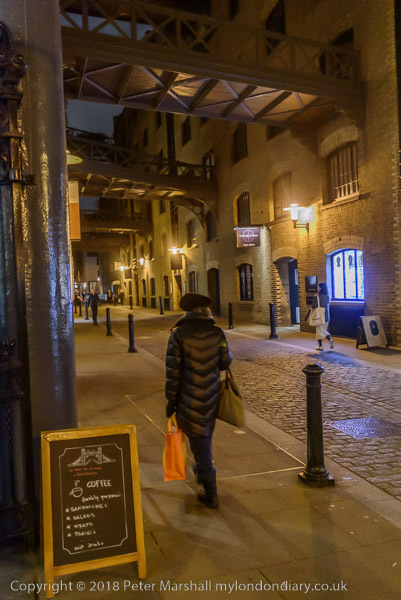 More from 2019 at Tower Bridge & Shad Thames. 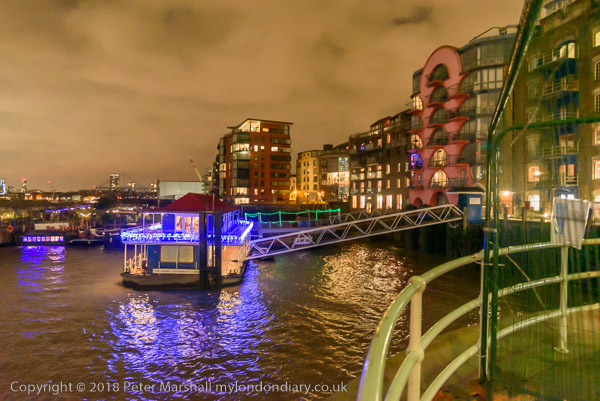 This entry was posted on Thursday, March 28th, 2019 at 09:36 am and is filed under LondonPhotos, My Own Work, Photo History. You can follow any responses to this entry through the RSS 2.0 feed. You can leave a response, or trackback from your own site.